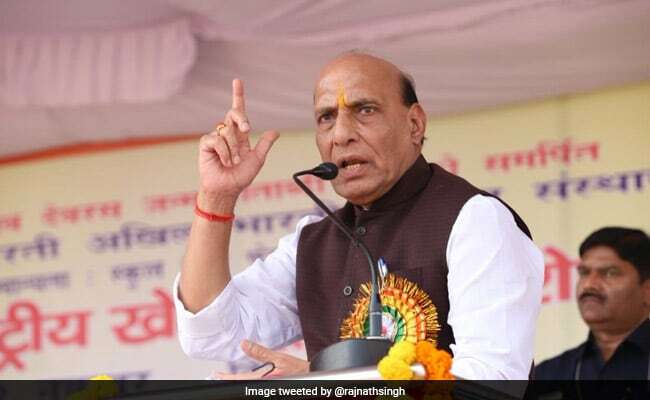 Dubbing the Congress as a "marriage procession without a groom", Union Home Minister and BJP leader Rajnath Singh on Friday said his party will be voted back to power in Madhya Pradesh for a fourth straight term on the basis of good work done by its government since 2003. Campaigning for the BJP for the November 28 polls, he accused the Congress of engaging in divisive politics. Rajnath Singh said there was hardly any development in Madhya Pradesh under the Congress rule, but things changed rapidly after the BJP came to power 15 years ago. "Till 2003 there were no roads and power rarely came in the state. After the BJP came to power, development took place at a rapid place," he said, addressing a poll rally at Tiyara in Singrauli district. "And the BJP on the basis of its good governance this time will hit a four (win a fourth straight term)," the Union home minister said. Taking a jibe at the Congress for not declaring its chief ministerial candidate, he dubbed the main opposition party as a "marriage procession without a groom". "There is not a single leader in the party who commands popularity among the people," said the former chief minister of Uttar Pradesh. On the contrary, Madhya Pradesh Chief Minister Shivraj Singh Chouhan is very popular and dedicated to the welfare of people, especially the poor, for whom he has launched a large number of schemes, he said. In an apparent reference to a purported video on Muslim votes featuring MP Congress president Kamal Nath, the senior BJP leader said the Rahul Gandhi-headed party has always indulged in the politics of dividing people. In the purported video, Mr Nath is allegedly asking a group of Muslims to ensure his party gets 90 per cent of votes in their booths. Congress leaders are fighting for their existence either in Chhindwara or Guna, the Union home minister maintained. Chhindwara and Guna are represented in the Lok Sabha by Congress leaders Mr Nath and Jyotiraditya Scindia, respectively.